Sriracha has had a hell of a year. First it looked like the iconic red rooster sauce from Southern California might be forced on an extended hiatus right at the height of its popularity. But then the condiment came roaring back because you can’t keep a good hot sauce down. All of a sudden it seems like everything was getting Sriracha-fied—whether it needed to be or not. Here’s a look at some of the most notable places it popped up this year. Because it would be a little cumbersome to keep dunking your potato chips in Sriracha, we saw a flood of hot sauce-flavored chips. Kettle’s entry into the condiment-hybrid world back in February was particularly tasty. One of the great Kickstarter successes of 2014, the makers of Sosu Sriachup beat their campaign goal by more than 500 percent. Rogue Brewing got on the Sriracha bandwagon with their Sriracha Stout, as did Brooklyn’s Sixpoint, whose Sriracha Ace came in to rave reviews in September. Flavored vodkas are rarely anyone’s friend. If we ever see whipped cream-flavored vodka again, it will be too soon. But spicy and vodka are a pairing with some history. A Sriracha Bloody Mary doesn’t sound like such a bad idea. 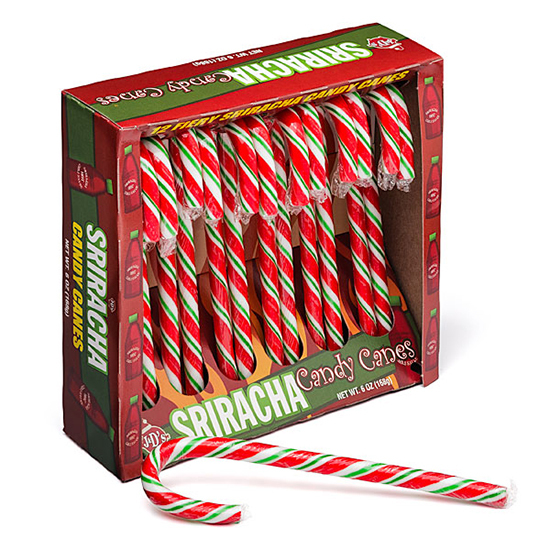 A limited-edition spicy snack brought to you this year not by the normal makers of Sriracha-flavored everything but the brilliant comic minds behind The Oatmeal. Apparently they’re good at a lot of things over there. What did Pizza Hut think it needed to pull itself out of the death spiral that so much of the fast-food world faced this year? Sriracha, that’s what. It was one of several new sauces The Hut brought out when it rebranded in the fall. Yeah, we don’t know either. Apparently Santa couldn’t get cases of the stuff sent up to the North Pole, so he had someone make him these instead.